#BOSSBABESATX IS PROUD TO SUPPORT THIS EVENT BY THE AUSTIN DEMOCRATIC SOCIALISTS OF AMERICA: FEMINIST ACTION COMMITTEE; ALL PROCEEDS FROM THIS SCREENING WILL BE DONATED TO THE LILITH FUND FOR REPRODUCTIVE EQUITY. 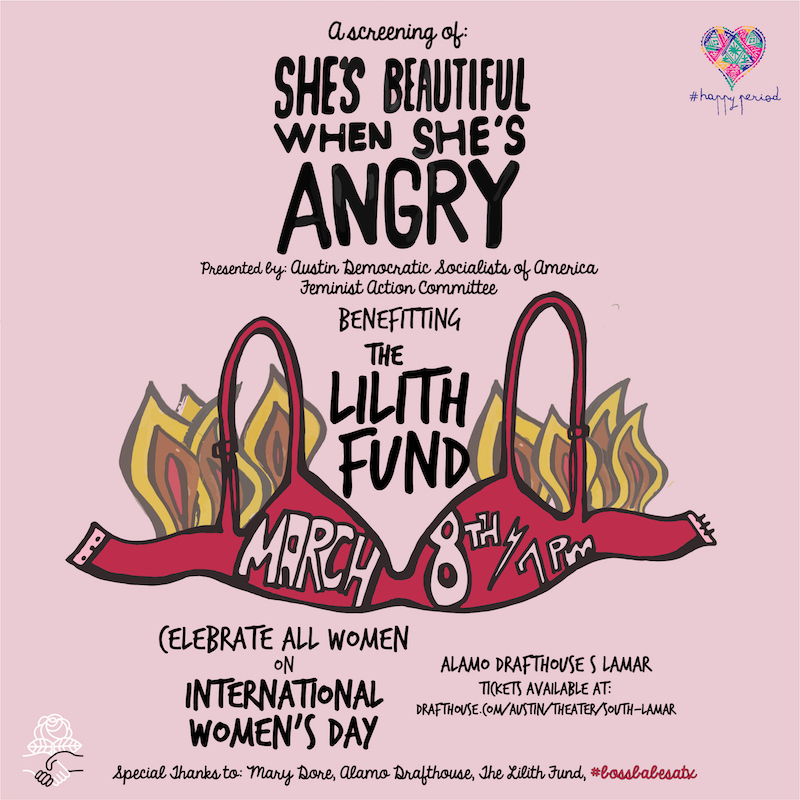 Please join us at the Alamo Drafthouse on International Women's Day, March 8 for a special screening of She's Beautiful When She's Angry—to raise money for The Lilith Fund of Austin! Directed by Mary Dore, this documentary film proves that women can change the world when we stand together. The movie starts at 7 PM, with doors at 6. You can mingle with the featured organizations for the evening: NARAL Pro-Choice Texas, The Lilith Fund and #HappyPeriodAustin. After the movie, the Austin Democratic Socialists of America's Feminist Action Committee will lead a discussion led by representatives from the Lilith Fund and feminist activists in Austin. Come get to know other feminists and join us for a night of fundraising for reproductive equity, education on feminist history and Austin activism! This event is presented by the Austin Democratic Socialists of America's Feminist Action Committee, in partnership with filmmaker Mary Dore, The Lilith Fund, Alamo Drafthouse and #bossbabesATX.